A portrait of Paulding County is a study of continuity and change. Our schools and libraries, our businesses, homes, and farms embrace the latest advances in technology and science. Yet, as we look ahead, our citizens remain rooted in traditional American values. The predominant industry in Paulding County is farming. In addition, there is an ever increasing number of businesses and manufacturers. County residents take pride in the diverse products that are shipped across the United States and around the world. Opportunity for artistic and self-expression, belief in the human spirit and soul, an appreciation of heritage, strong sense of individualism, self-reliance, and pride, and solid ties to home, family, and friends. In Paulding County’s school districts, dedicated staff members and involved parents create an environment that supports more than 4,100 students and helps them learn. Educational offerings include advanced courses, vocational programs, and opportunities for those with special needs. Children and their education are a priority in Paulding County. Quality down-to-earth instruction combines with the computer age to prepare our children to meet the future. See below to view a full listing of schools in Paulding County. Paulding County, formed in 1820, is named for Revolutionary War hero John Paulding. The youngest patriot, along with two others, captured Major Andre, a British spy. The current county seat was established in the Village of Paulding in 1851. The county’s 416 square miles are home to eleven villages and more than 20,000 residents. Until the 1800’s, Paulding County was part of the heavily forested “Great Black Swamp” that covered northwest Ohio. The area was cleared and drained by hard-working settlers in the second half of the 19th century, turning it into some of the most fertile farmland in the state. The construction of the Wabash & Erie Canal and the Miami Canal through Paulding County in the mid-1840s helped foster the county’s early development. These vital thoroughfares met at the village of Junction. the merging of the canals made Junction the chief rival of Fort Wayne as the area’s center of commerce. Remains of these two canal systems can still be seen today. Safety in knowing your neighbors, traditional family values, friendship and memories, opportunity for community involvement, and casual, easy-going fun. Paulding County has two major rivers within its boundaries; the Maumee River, a state-designated scenic river and the Auglaize River. Several streams, creeks, and smaller rivers wind through the county. The county’s parks, campgrounds, swimming pools, and golf courses offer many recreational opportunities. Cultural and civic activities include two museums, a community band, theater groups, local summer and fall festivals, the county fair, youth activities, senior citizen’s center, and a wide variety of active clubs, organizations, and churches. 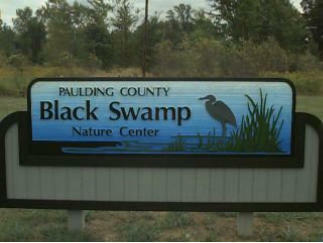 The Paulding County Commissioners, Paulding Soil and Water Conservation, and the Black Swamp Nature Center Advisory Committee invite County residents to visit the Black Swamp Nature Center. The Nature Center formally known as the Paulding Ponds has received numerous improvements throughout the summer. The Improvements to the nature center have been made possible through a grant from the William J. Flickinger Fund of the Van Wert County Foundation along with the time and commitment of many interested individuals and organizations. It is the goal of the Paulding County Commissioners, Soil and Water Conservation District, and the local Advisory Committee to provide an area where friends of nature can fish, bird watch or hike. One picnic table is available for use, with three more to be placed this fall. Teachers, Scout and 4-H leaders, and other groups are encouraged to utilize the area as an outdoor classroom or meeting spot. The Paulding Soil and Water Conservation District has many educational items available for loan to help with the learning experience. The Black Swamp Nature Center contains 51 acres consisting of 24 acres of woodland, 14 acres of wetlands, and 6 acres of old meadow. The nature center has many assets which enhance its use. A boat launch allows easy access to Flat Rock Creek, while trails wonder around the top banks of three ponds, along Flat Rock Creek, and past the old Sugar Beet Dam. The Paulding County Fairgrounds border the nature center on its northeast side, with two access trails allowing easy entrance. The old meadow and wetland areas provide an excellent habitat for many species of birds and plant life. The black Swamp Nature Center provides a wonderful area to observe bird life, especially during the Spring and Fall migrations, according to Doug and Micki Dunakin, who conduct field trips with the Black Swamp Chapter of the Audubon Society. The diversity of “mini-habitats” gives the visitor an opportunity to observe woodland, marshland and meadow species within a very small area. Over the years, the Dunakins have seen 175 species of birds on the property, including both American and Least Bitterns, 16 species of ducks and 32 species of warblers. During the summer months, the Center provides nesting cover for many songbirds as well as mallards, wood ducks, Canadian Geese, and green herons. Even at the peak of summer heat, migrating shorebirds find their way to the exposed mud flats in the ponds. Black Swamp Nature Center rewards the watchful eye and attentive ear with many delights. The nature center is open from dusk until dawn; individuals with special needs or questions are encouraged to contact the Paulding Soil and Water Conservation District at 315 N. Walnut Street, Paulding or call (419) 399-4771. Wildlife populations consist of a variety of small game animals, song birds, and deer. Introduction of wild turkeys into the county has proven successful. Because of local conservation clubs and individual landowners’ involvement, the pheasant population is increasing.